So far in our “Gettin’ Fancy with Foil” series we’ve tackled the basics and personalized foil bookmarks. 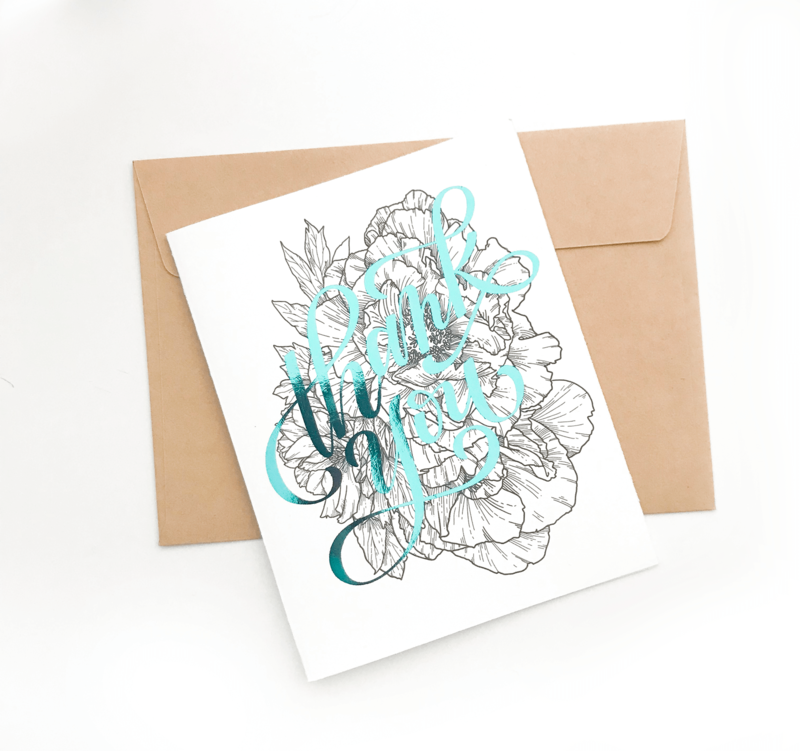 Now that we’re running headfirst into greeting card season, I figured it was about time we tackled those! 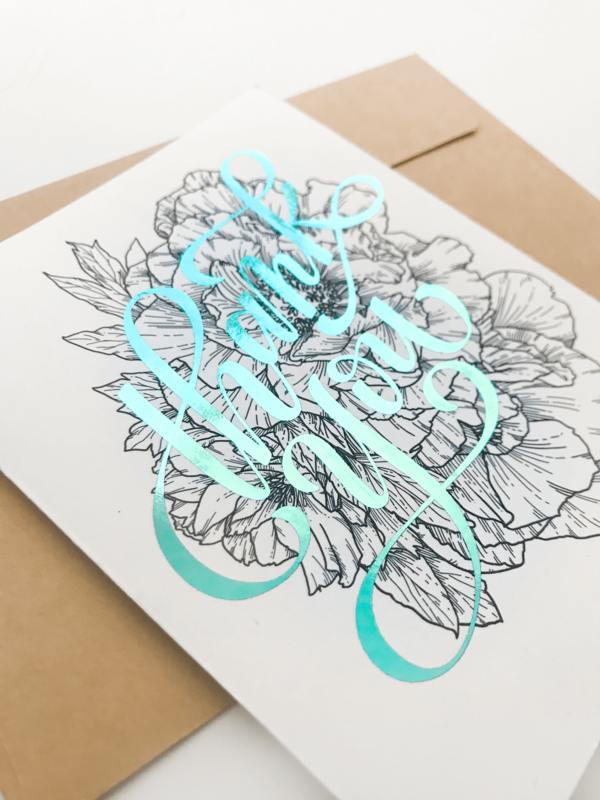 So, our next hand lettered foil project in this series are greeting cards that juxtapose a non-foiled, black design against a pop of foil. 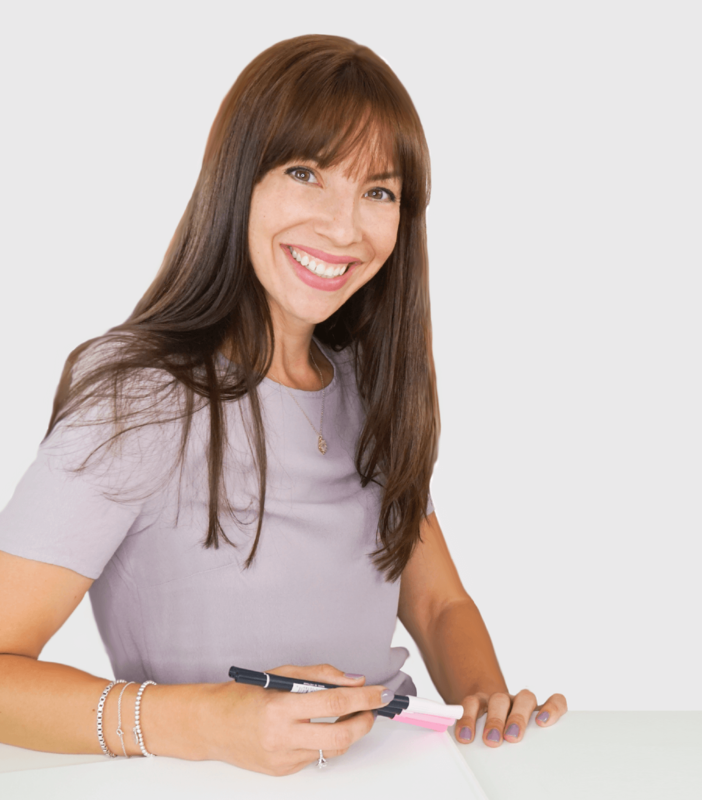 This technique does require a couple trips to two different types of printers (which your local copy center should have in case you don’t!) but the results are well worth it! 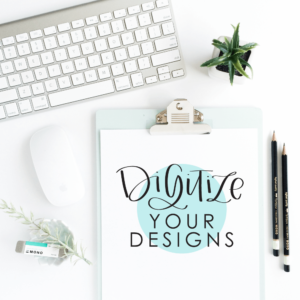 There are so many creative ways that you can use this technique. 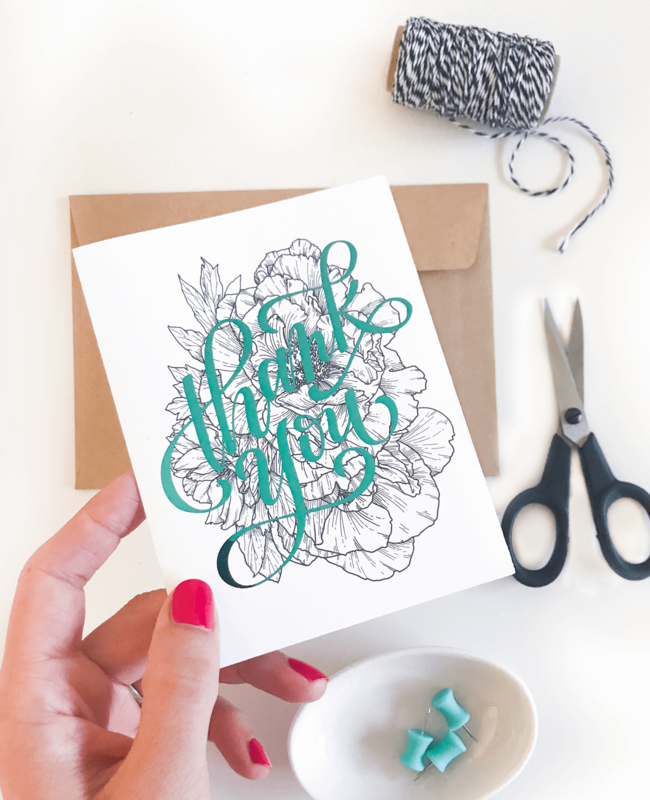 A black illustration with a few of the picture’s details popping in foil, black hand lettering with a foiled sentence that you want to stand out, a black illustration with a stand-out foil message on top – I could go on and on! 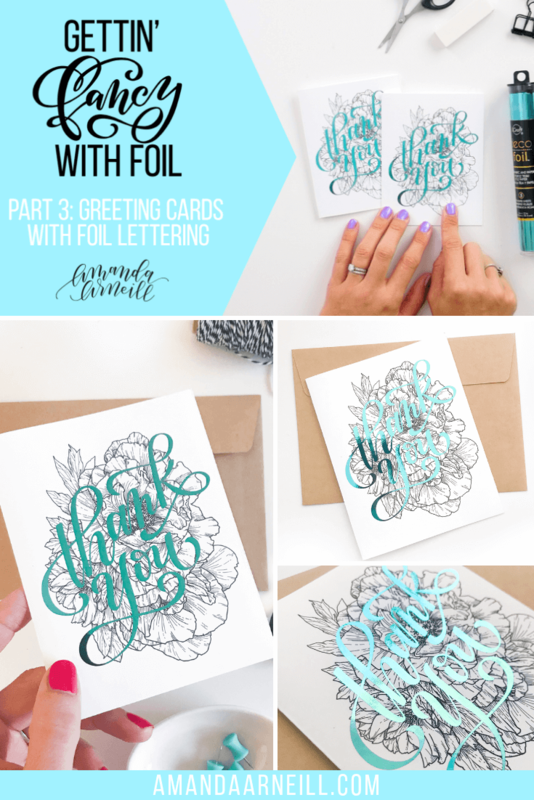 In Part 3 of our 4-Part “Gettin’ Fancy with Foil” video lesson series you will learn how to create this type of foiled greeting card so that you will be ready to take this technique and run with it. 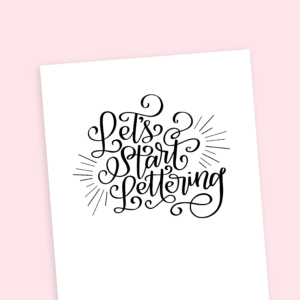 Get ready to dominate greeting card season! Just scroll down to watch the video tutorial, find the fully linked supply list and download the Procreate compatible greeting card template on to your iPad. WATCH THE FULL VIDEO TUTORIAL HERE! Greeting Card Procreate Template (for instructions on how to download and install a zipped template, click here). To download straight from Dropbox, click here. An inkjet printer. This is the Canon printer that I use. A laser printer. This is the Brother printer that I have and it works well for my foil projects. 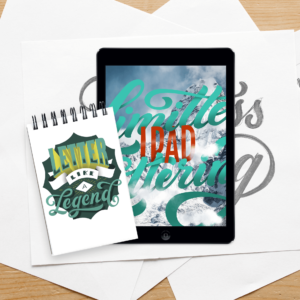 Download and install the Greeting Card Procreate Template to your iPad (for instructions on how to download and install a zipped template, click here). To download straight from Dropbox, click here. Give them to the lucky recipients! 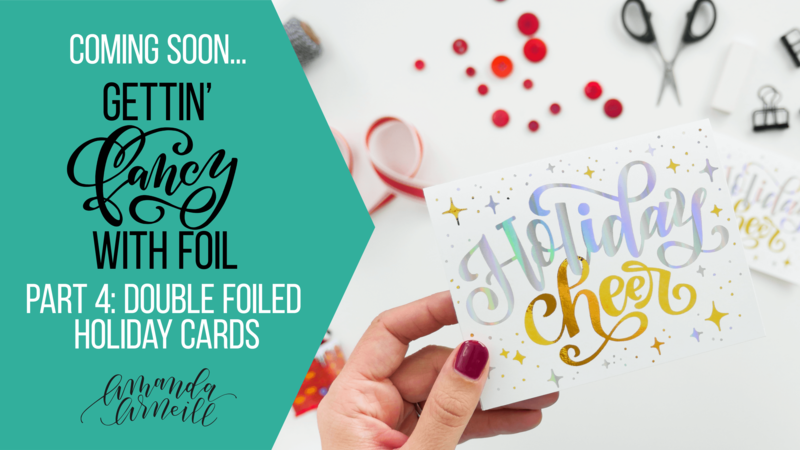 Join me next “Foil Friday” when our project will be holiday greeting cards using a jaw dropping “double foil” technique. Happy foiling!